Professional athletes speak often about the adrenaline high that carries them through challenging periods of athleticism. Ask a member of the Shark Lab to describe a longline-caught shark-workup and you will find the response matches the adrenaline-fueled recounting of professional athletes. At the Shark Lab, you are extensively trained in shark handling and work-up procedures before you are involved with such an adrenaline-fueled act as a longline check and work-up. As a repeat Sharklab volunteer, I knew the exciting possibilities waiting for me on a 20:00 longline check. Making her way out the channel and around the eastern tip of South Bimini, Twin Vee carried us to the lines set across the mouth of the Bimini nursery. Sighting the first float of the first line, the adrenaline begins to slowly leak, as you acutely survey the line for missing or submerged gangions. 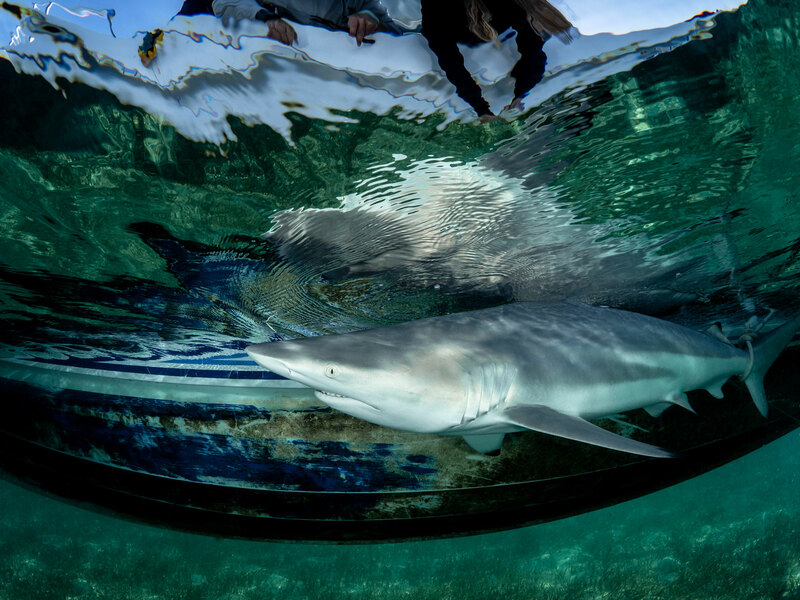 Like the pro-athletes would describe, it’s muscle-memory: holding onto Twin Vee’s rail while leaning out to sight each gangion, or as we all hope, to not sight one, the gangion float having been pulled under by the weight of one of Bimini’s several possible shark species. To the astonishment of the crew, we had three blacktips (C. limbatus) that night, all caught on the fifteenth gangion of their respective line. By the time we finished the first work-up, the air was palpably buzzing, smiles and high-fives were shared by all. But with the shark safely off the side of the boat, the adrenaline began to slowly dissipate, and the attention was returned to scanning the lines for another submerged gangion. When we came upon the second black-tip, again on gangion #15, the buzz returned. Flood lights on, the team moved swiftly to bring this female up to the side of Twin Vee. I elected to hold her first dorsal fin, working to secure her position in the water, so the rest of the team could perform the various work-up measurements and samples as swiftly as possible. It was holding this female’s dorsal where I had a unique opportunity to see very fresh mating scars. The female’s dorsal side was littered with bite-marks. Elasmobranchs can heal their wounds remarkably fast; this female’s wounds hadn’t healed over yet, which indicated the mating event had occurred recently. Moments like this, a shark less than a metre from your face, with the types of ecological evidence you normally would only be able to see from metres away, are the adrenaline-filled moments that litter your months at the Sharklab. The night proceeded with a third blacktip on another line’s gangion #15 – the boat erupted in astonishment. Smiles and laughs quickly turned to well rehearsed action, as another episode of swift data collection was underway. Eight minutes blitzed by and with another successful work-up complete, so too another blacktip swam away from Twin Vee, an official member of the BBFSF tagged-elasmobranch club.